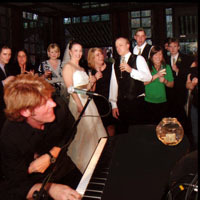 This dueling pianos show is a unique form of entertainment you can’t find anywhere else - music, comedy, and crowd interaction tailor-made for your audience. Our players adapt to crowds from ages 18 through 80 with any taste in music. More impressively, they can play for audiences with a mix of all ages. The two players work together to provide a high-energy show in which the audience is as much a part of the entertainment as are the performers.